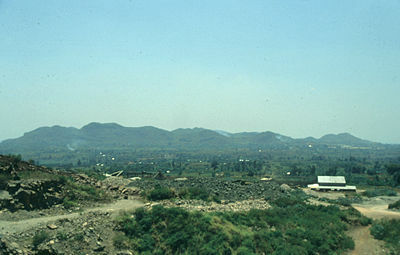 The carbonatite complex of Sukulu, Uganda, as seen from Tororo Rock. Carbonatites are unusual igneous rocks that contain carbonate minerals at levels that exceed 20 percent (by volume). Their additional mineral composition may include apatite, barite, fluorite, or magnetite. Their elemental content may include barium, cesium, and rubidium, with lesser amounts of hafnium, titanium, and zirconium. Nearly all known carbonatite deposits are intrusives—that is, they are found beneath the Earth's surface. This is because carbonatite lava flows are unstable in the atmosphere and are altered by relatively rapid reactions. Yet, exposed carbonatite lavas are not as uncommon as once thought. The study of carbonatites has helped scientists unravel a segment of geological history, and some of these rocks have provided commercially valuable quantities of minerals. Carbonatites usually occur as small plugs within zoned alkalic intrusive complexes, or as dikes, sills, breccias, and veins. They are, almost exclusively, associated with continental rift-related tectonic settings. The majority of carbonatites are Proterozoic or Phanerozoic in age. It appears that there has been a steady increase in the carbonatitic igneous activity through the Earth's history, from Archean to present. Associated igneous rocks typically include ijolite, melteigite, teschenite, lamprophyres, phonolite, foyaite, shonkinite, silica-undersaturated pyroxenite (essexite), and nepheline syenite. Areas where carbonatites have been found include: Oka and St. Honore, Quebec; Iron Hill and Gem Park, Colorado; Magnet Cove igneous complex, Arkansas; Mountain Pass, California; Phalaborwa, South Africa; Jacupiranga, Brazil; Ayopaya, Bolivia; Kovdor, Russia; the Mount Weld and Mud Tank intrusive carbonatites of Australia; and the Fen Complex, Norway. The Ol Doinyo Lengai volcano, in the Great Rift Valley in Tanzania, is the world's only active volcano that erupts natrocarbonatite lava with nearly no silicon content. It erupted the lowest temperature lava in the world, at 500-600 °C (930-1,100 °F). Other, older carbonatite volcanoes are located in the same region, including Homa Mountain. The Mount Weld carbonatite is unassociated with a belt or suite of alkaline igneous rocks, although calc-alkaline magmas are known in the region. The genesis of this Archean carbonatite remains contentious, as it is the sole example of an Archean carbonatite in Australia. Carbonatites are rare, peculiar igneous rocks formed by unusual processes and from unusual source rocks. Historically, these rocks were thought to be formed by the melting of limestone or marble by intrusion of magma. This mechanism, however, is discounted by geochemical and mineralogical data. There is evidence for each of these processes, but they all involve unusual phenomena. The primary mineral content of carbonatites is highly variable, but it may include natrolite, sodalite, sovite, apatite, magnetite, barite, fluorite, ancylite group minerals, and other rare minerals not found in more normal igneous rocks. They may also be sources of mica or vermiculite. Recognition of carbonatites may be difficult, especially as their mineralogy and texture may not differ much from marble save for the presence of igneous minerals. Natrocarbonatite is made up largely of two minerals: nyerereite and gregoryite. Nyerereite was named after Julius Nyerere, the first president of independent Tanzania, and gregoryite was named after John Walter Gregory, one of the first geologists to study the Great Rift Valley and author of the book The Great Rift Valley. These minerals are both anhydrous carbonates rich in sodium and potassium. Upon contact with moisture in the atmosphere, they react quickly, converting the dark lava and ash to white material within a few hours. Carbonatite, if composed entirely of carbonate minerals, is extremely unusual in its major elemental composition as compared to silicate igneous rocks, because it is composed primarily of Na2O and CaO plus CO2. Most carbonatites tend to include some silicate mineral fraction. Silicate minerals associated with these rocks are pyroxene, olivine, and silica-undersaturated minerals such as nepheline and other feldspathoids. Geochemically, carbonatites are dominated by incompatible elements (Ba, Cs, Rb) and smaller amounts of compatible elements (Hf, Zr, Ti). This, together with their silica-undersaturated composition, supports inferences that carbonatites are formed by low degrees of partial melting. Carbonatites may contain various elements, such as rare earth elements: copper, iron, phosphorus, niobium, uranium, thorium, titanium, barium, fluorine, and zirconium. A number of these elements are found in economically valuable concentrations. Hawaiian Volcano Observatory. 2003. World's Coolest Lava is in Africa U.S. Geological Survey. Retrieved December 8, 2007. Modreski, Peter J., Theodore J. Armbrustmacher, and Donald B. Hoover. 1995. Carbonatite Deposits U.S. Geological Survey. Retrieved December 8, 2007. Descriptive Model of Carbonatite Deposits U.S. Geological Survey. This page was last modified on 10 January 2017, at 20:47.